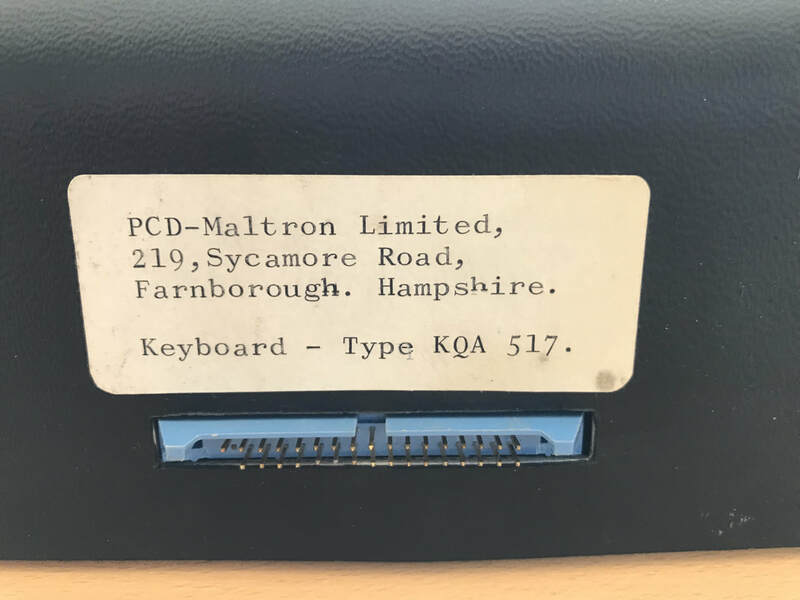 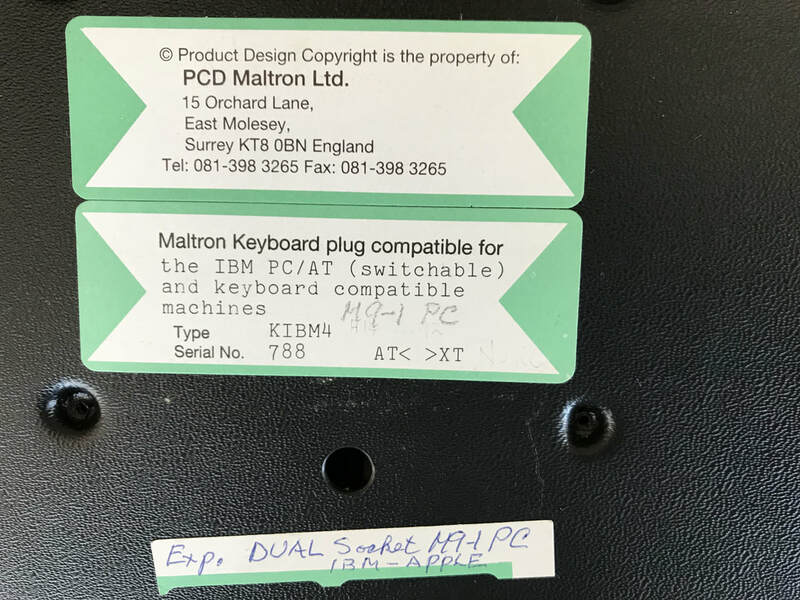 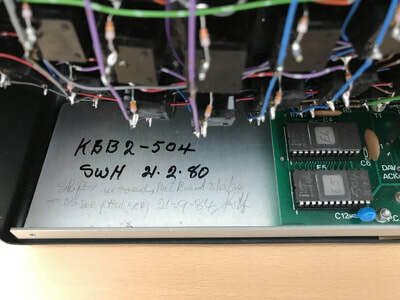 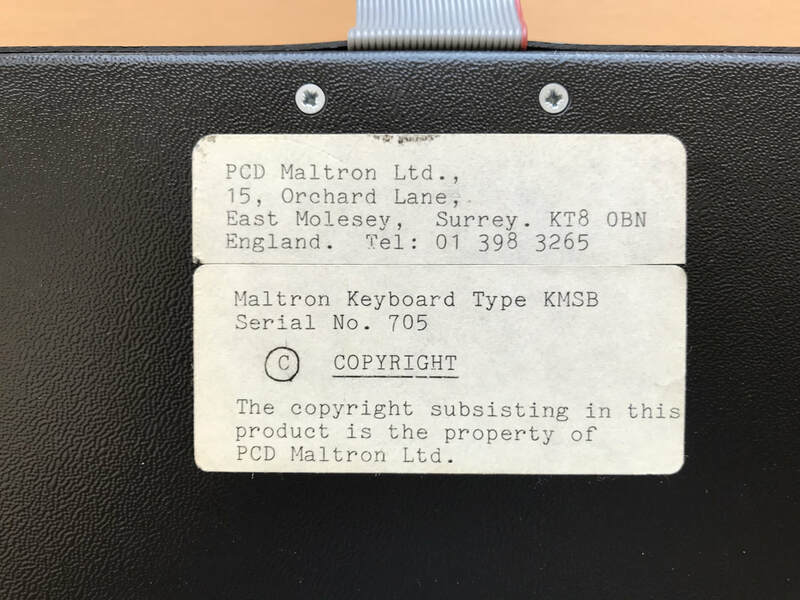 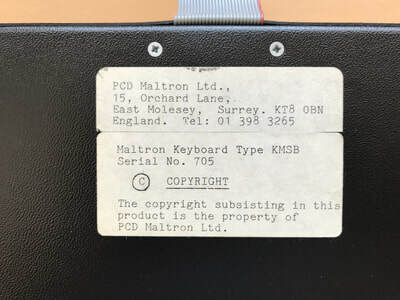 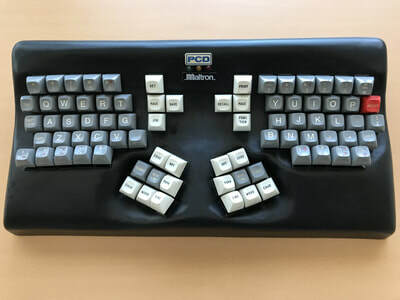 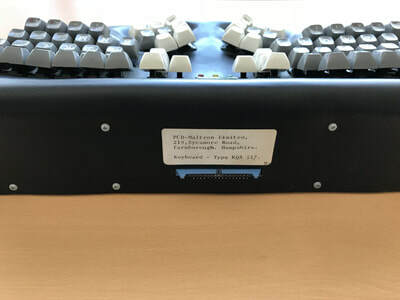 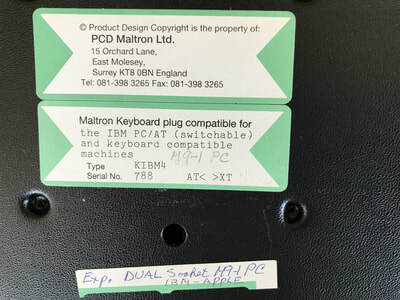 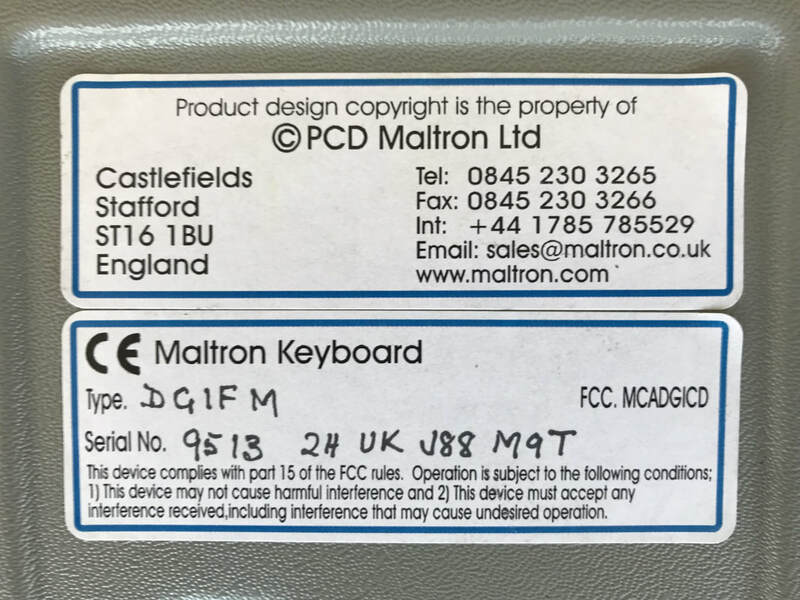 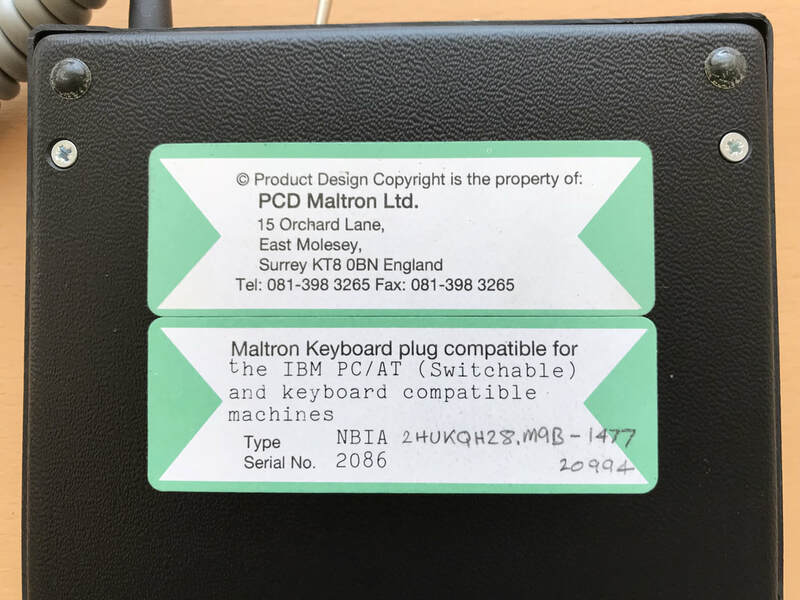 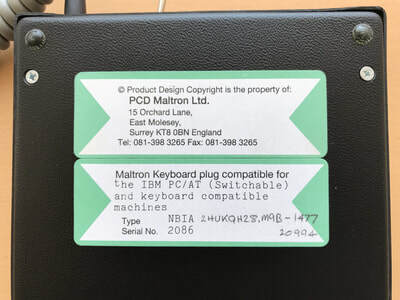 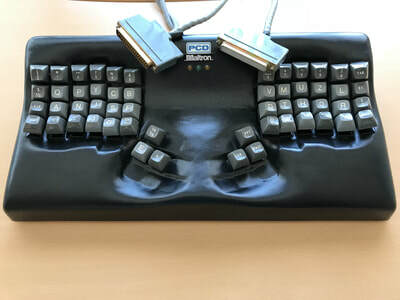 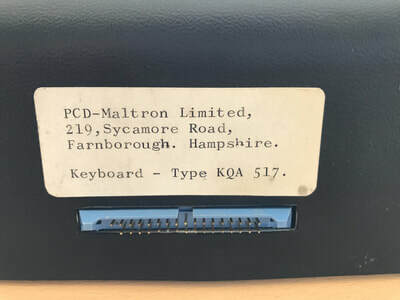 This page contains a collection of early and/or innovative keyboards designed and sold by PCD Maltron Ltd. 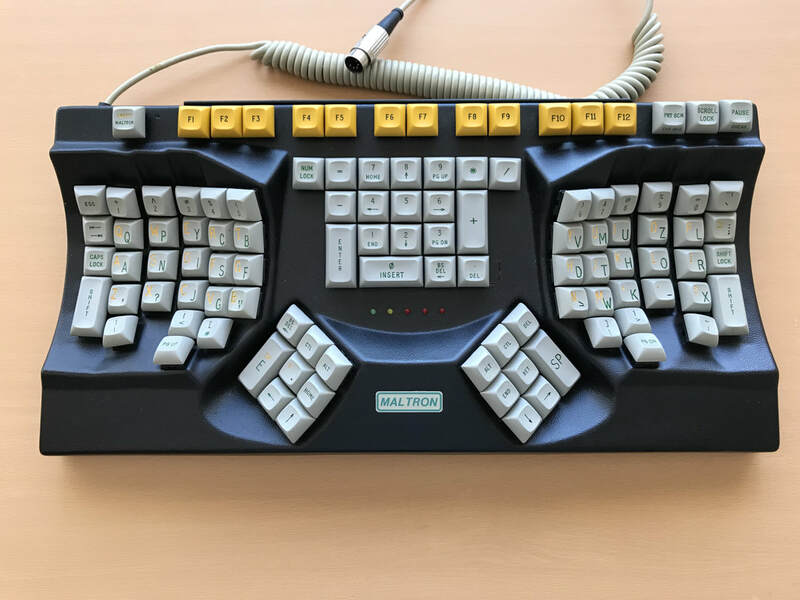 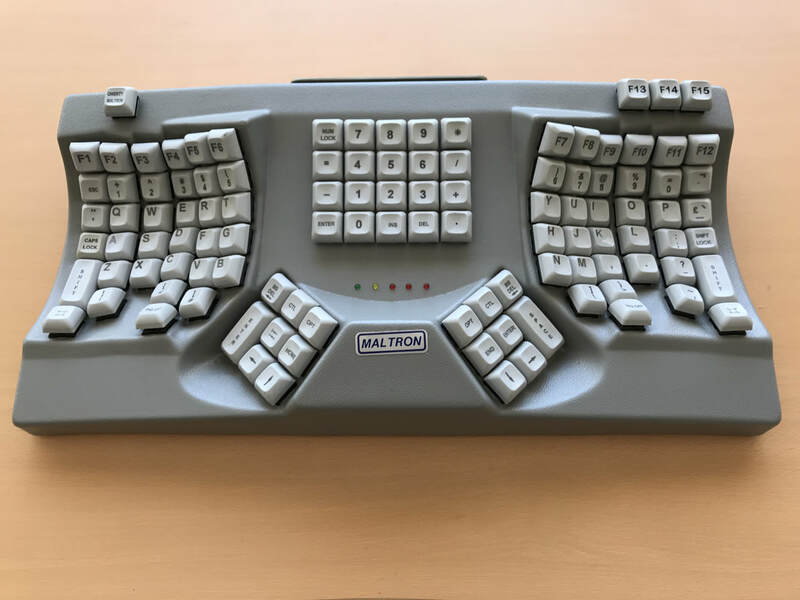 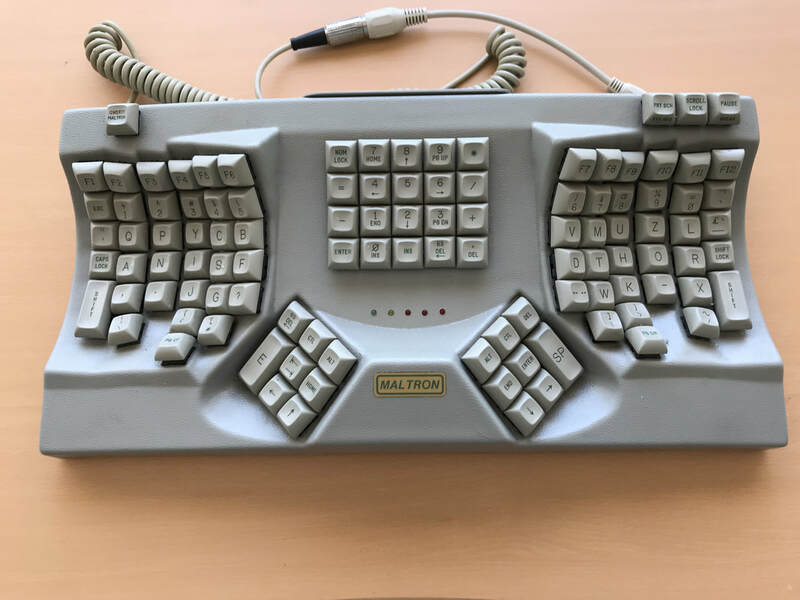 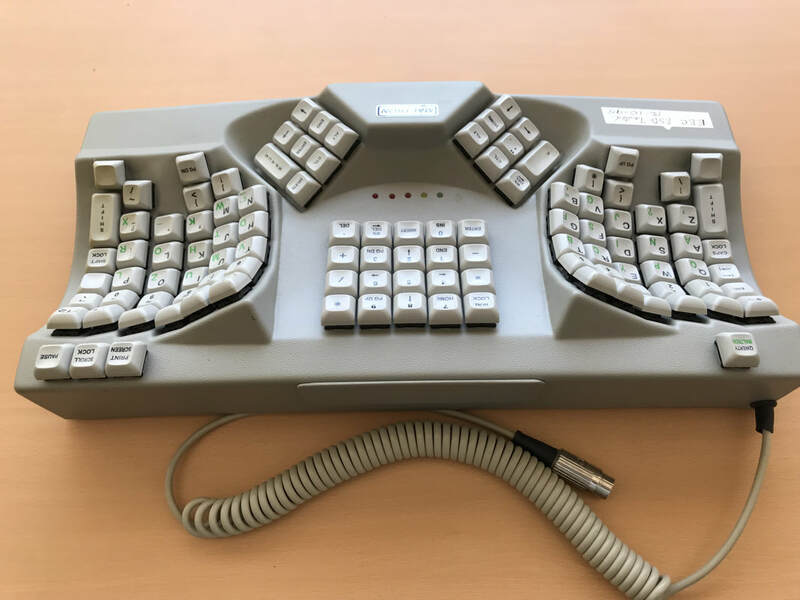 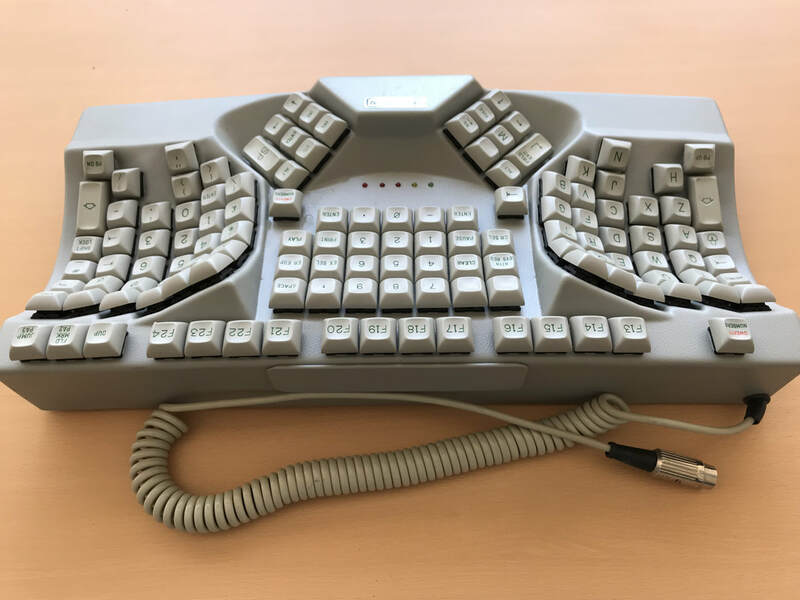 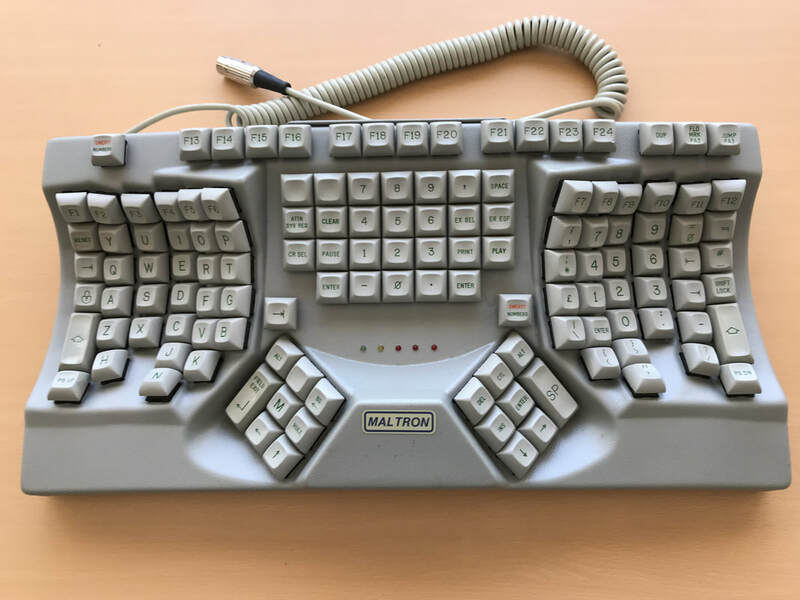 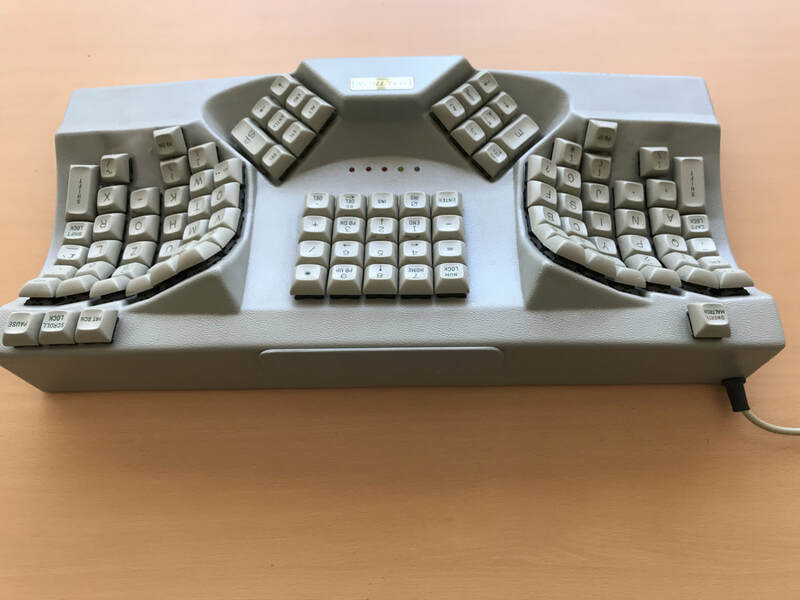 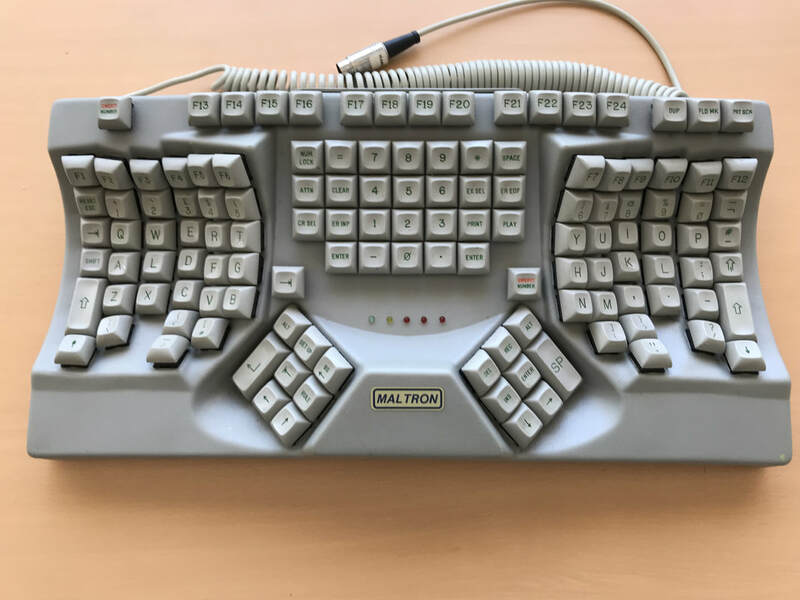 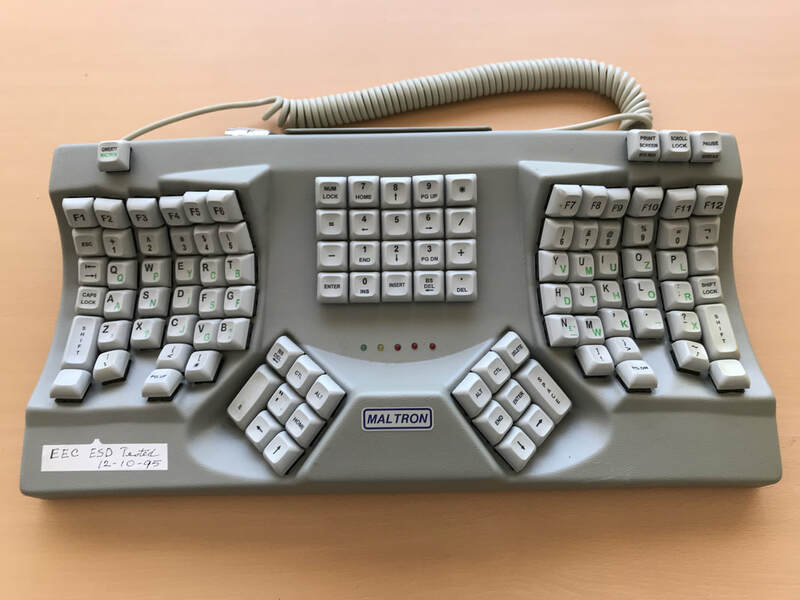 Some are very early examples, and some more recent, but all have a place in the history of the Maltron ergonomic keyboard company. 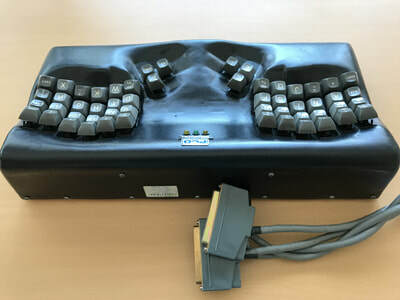 No 500, Type KCA-1, C1980. 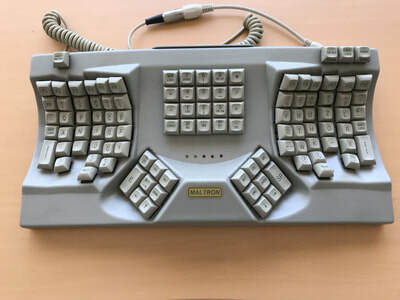 The original Maltron keyboard. 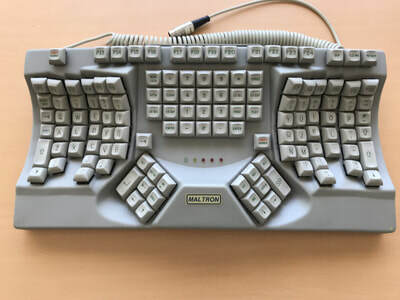 Designed with the vastly superior (over QWERTY) Maltron letter layout, notably with the letter E on the otherwise redundant left thumb. 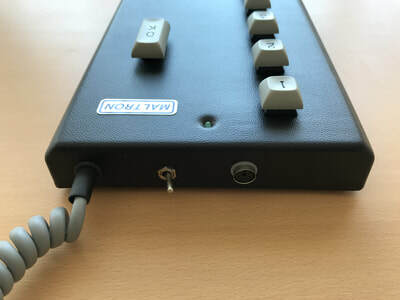 Devlin Key switches were used. 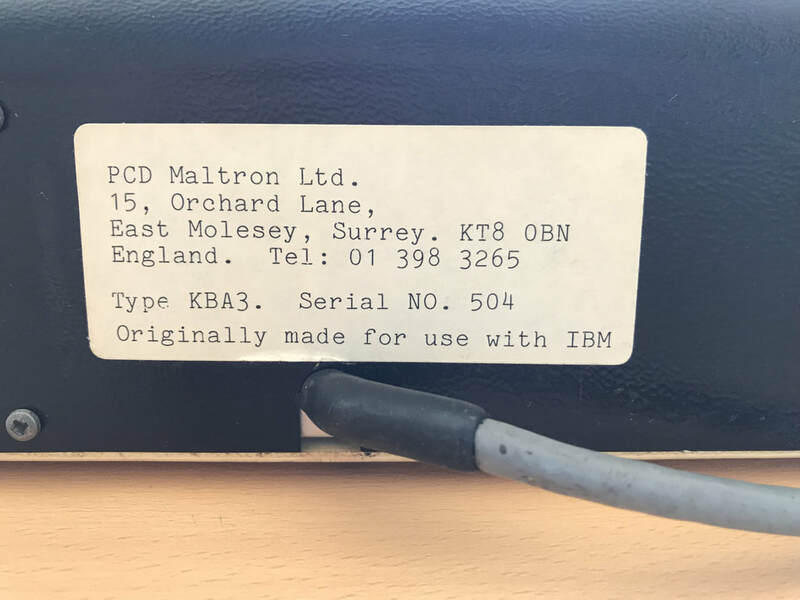 No 504, Type KBA3, 1980. 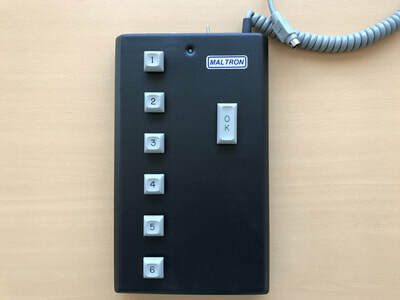 Mains powered version of the model above. 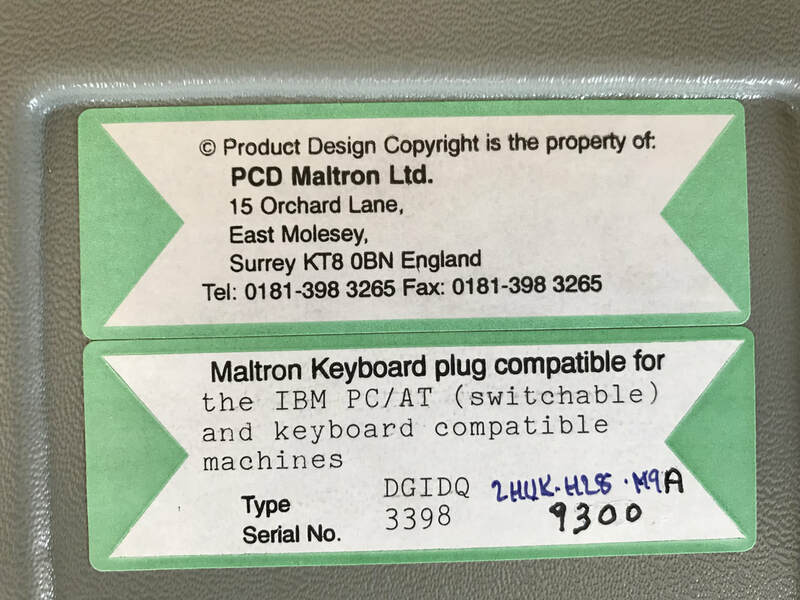 Strangely, the PCB in the keyboard dates from 1977. 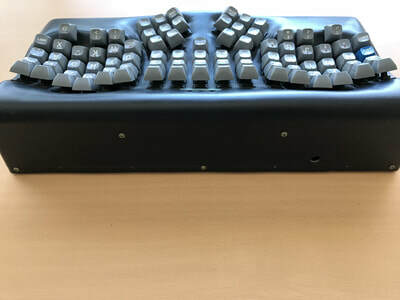 No 517, Type KQA, 1980. Same keyboard shape designed to reduce the abduction of the wrists. Due to lack of sales the company offered the world renowned QWERTY letter layout. 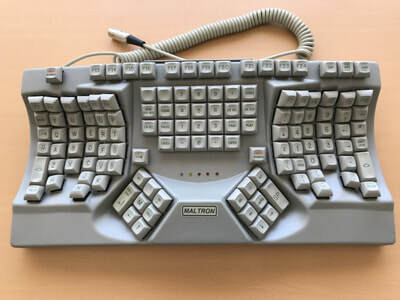 As a result, sales increased. 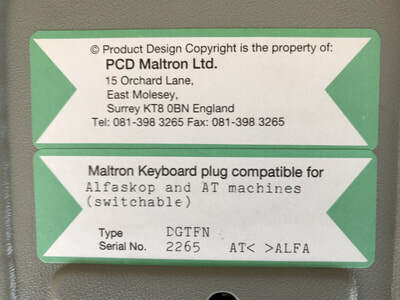 This keyboard shows keys that are particular to the printing industry, in which Lillian Malt had a good reputation. 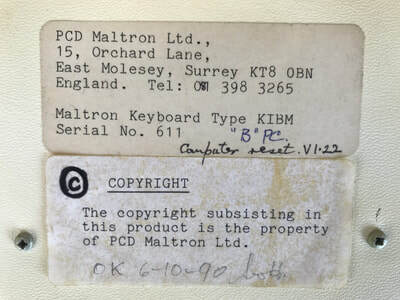 No 528, Type KBO, c1981. 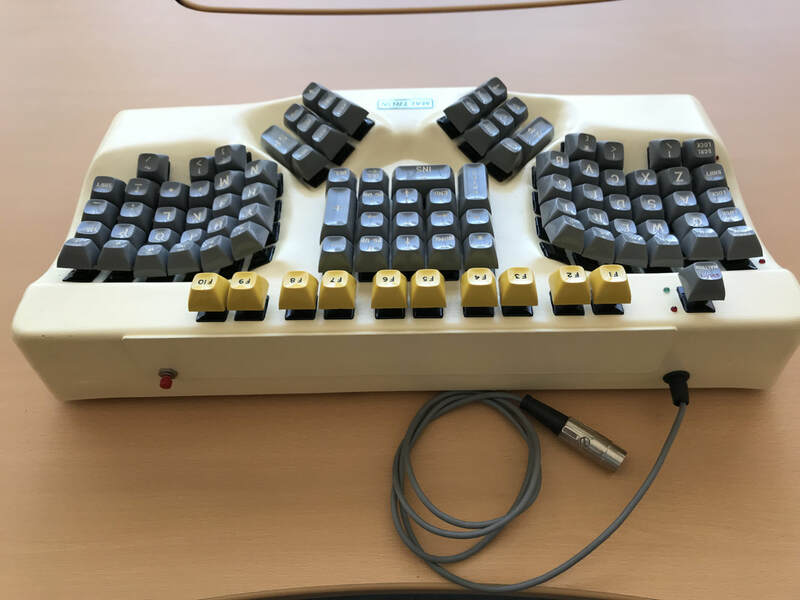 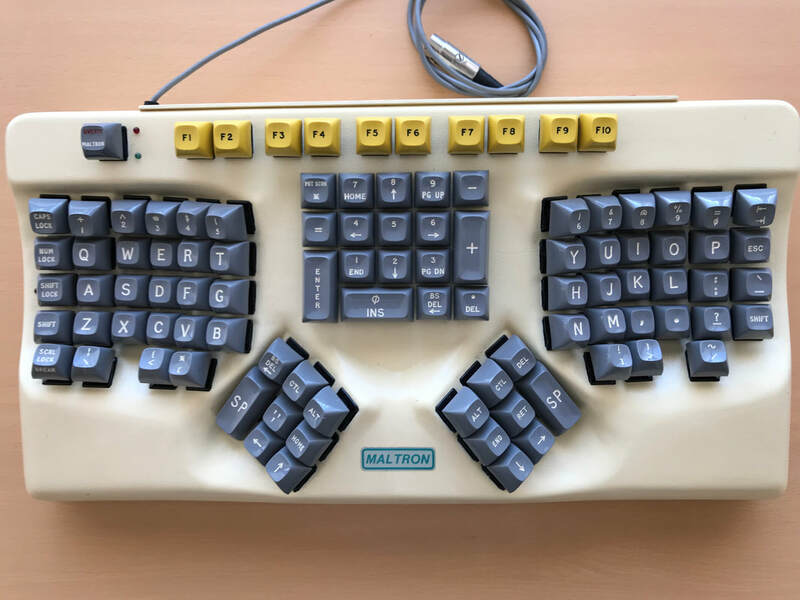 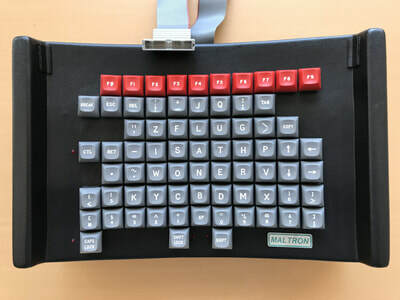 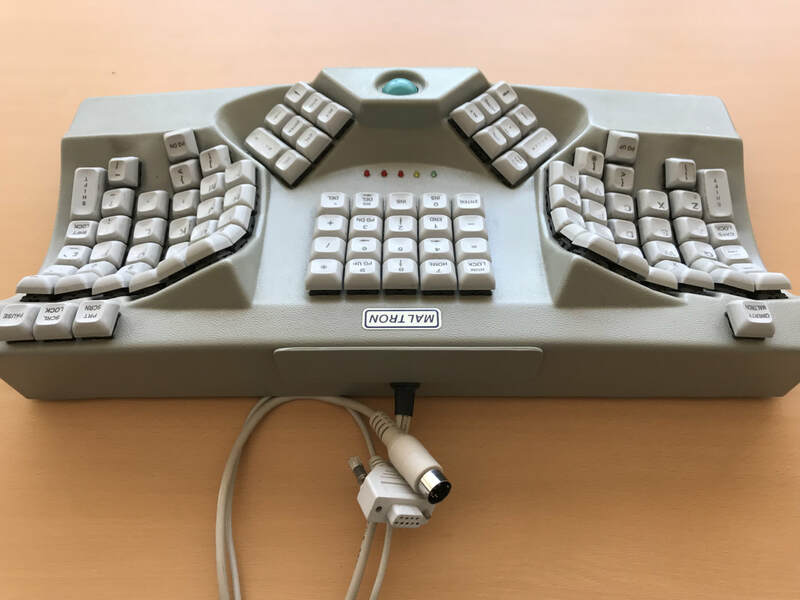 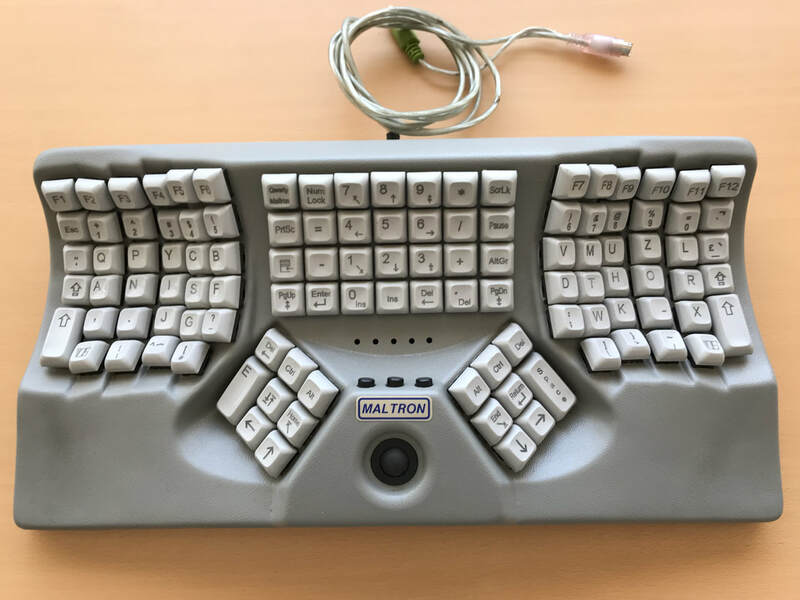 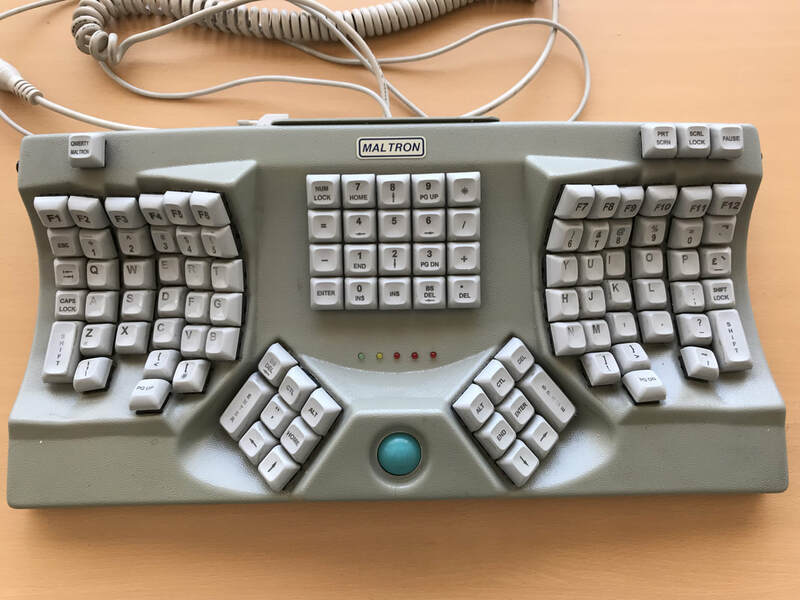 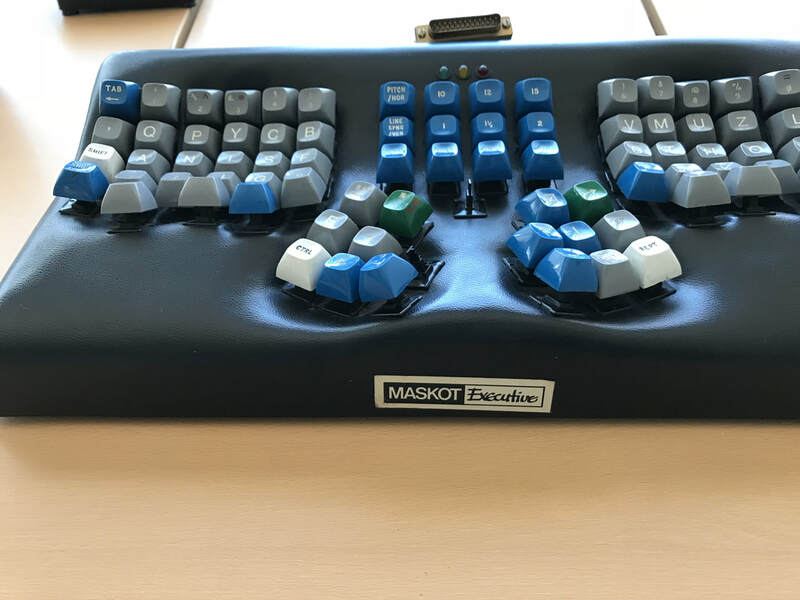 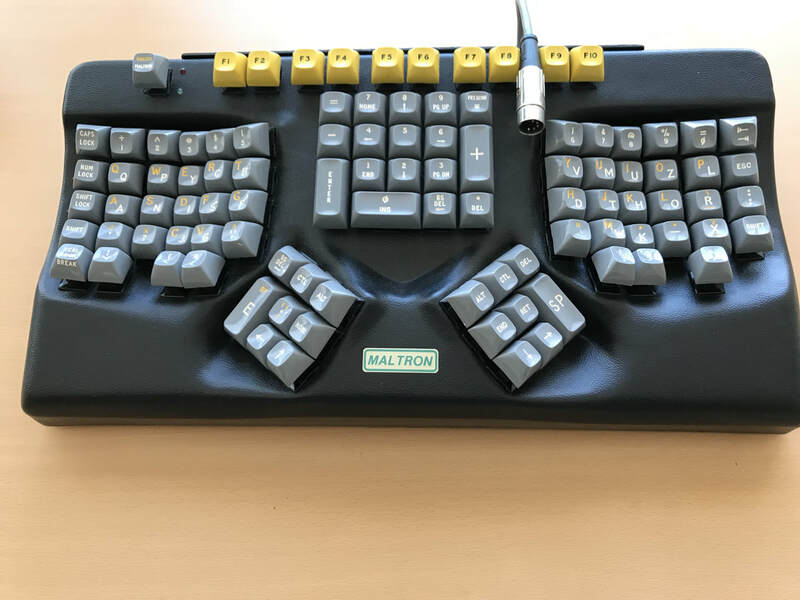 With the Maltron letter layout, this keyboard was designed for the Maskot computer trolley concept which sadly did not catch on. 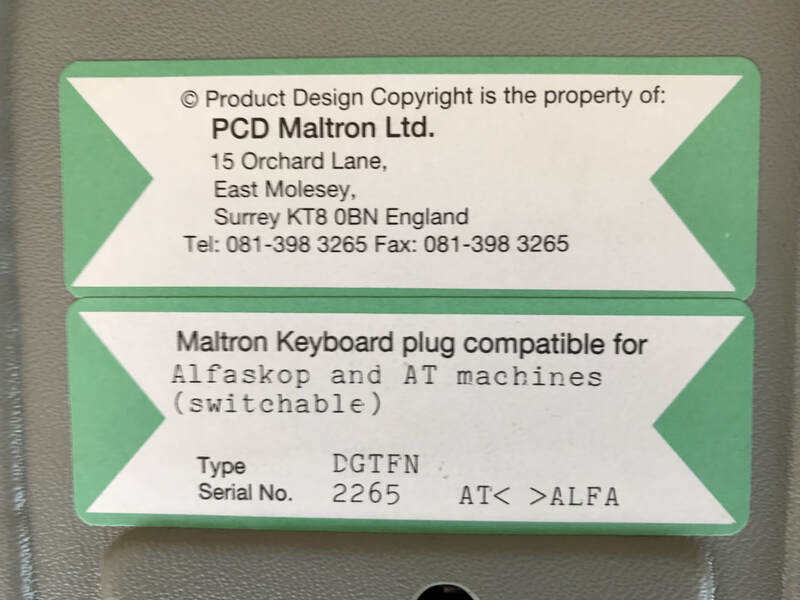 The keyboard also shows the QWERTY / Maltron letter layout switch. 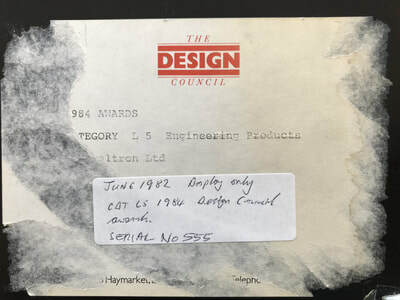 No 555, 1984. 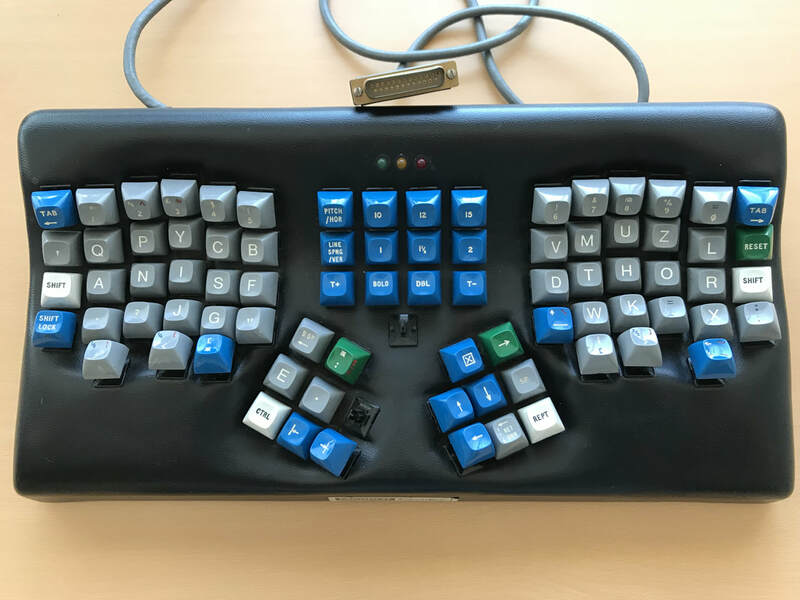 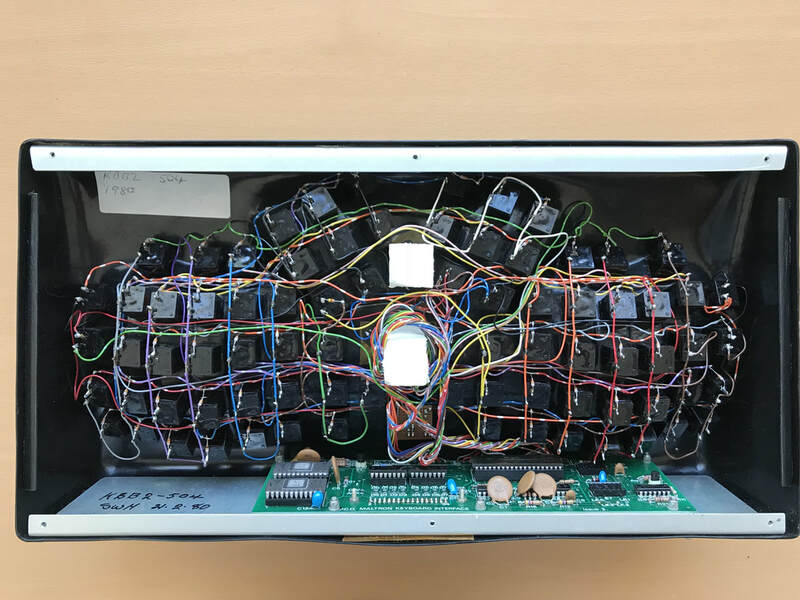 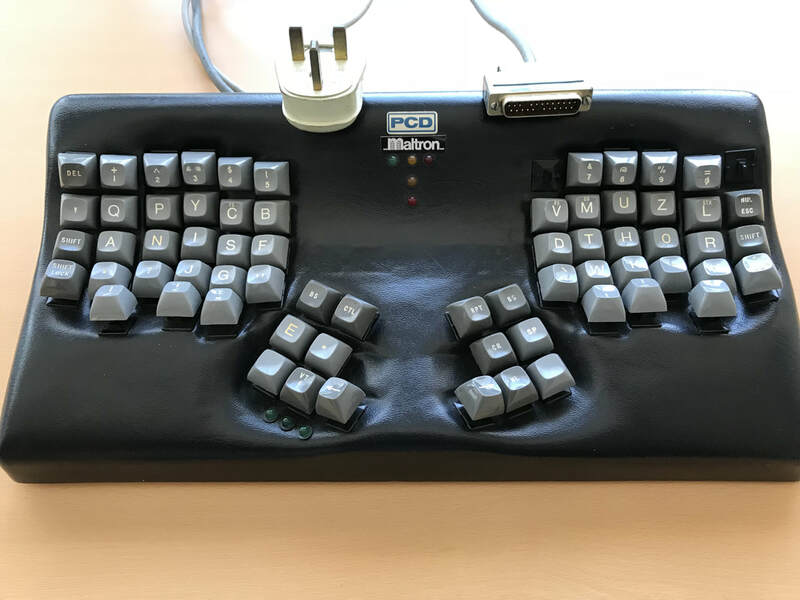 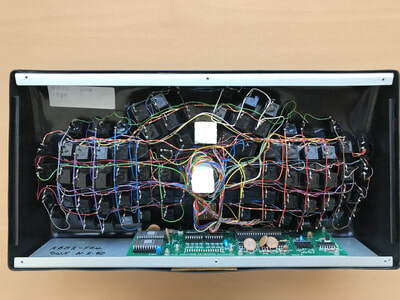 This keyboard was entered into the Design Council Awards under category 5 Engineering Products. No 611, Type KIBM, Cream shell with only F1 to F10 AT connector, designed to work with IBM computers. 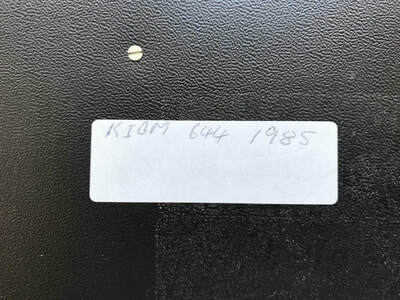 No 644, Type KIBM, 1985. An early example of the QWERTY dominant (characters top left as against bottom right) dually engraved key tops with 10 function key and an AT connector. 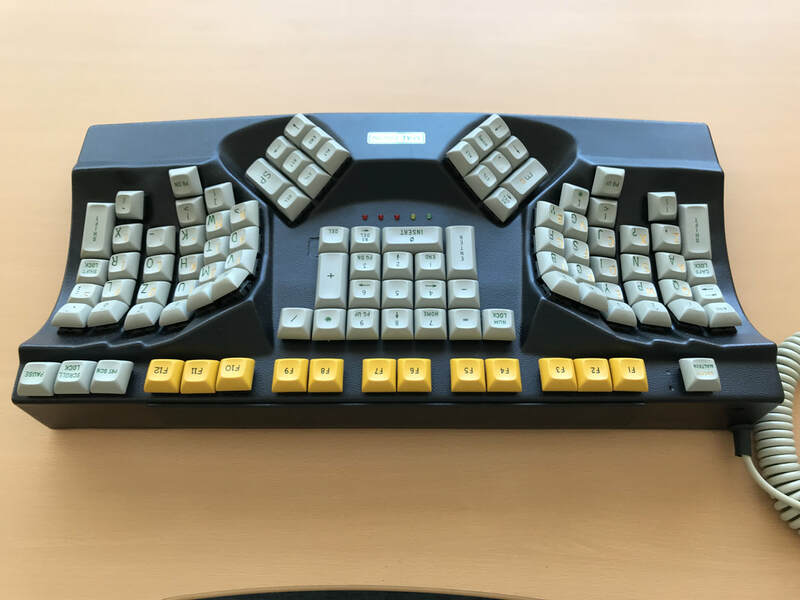 The new shell shape is the first shape to reduce both the abduction and pronation of the wrists, as the keys in the centre (index finger usage) are physically higher than those under the little finger. 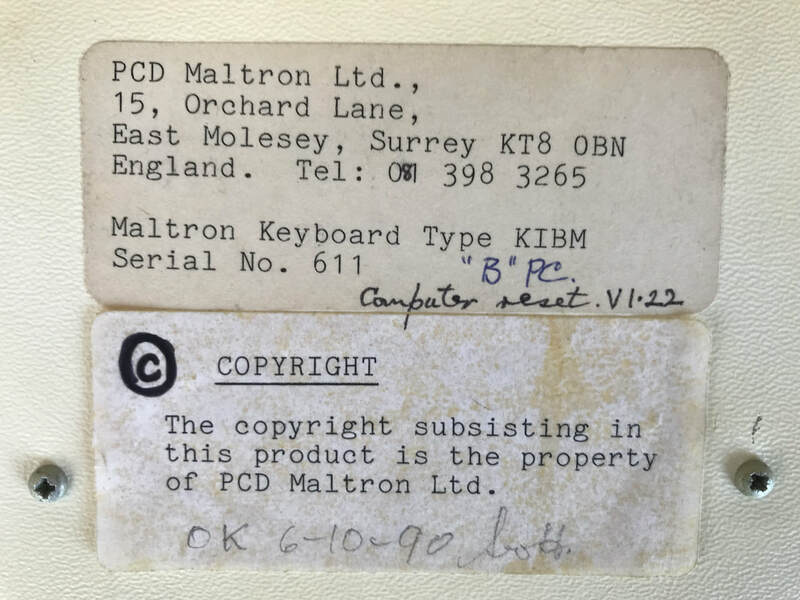 No 705, Type KMSB, 1987. Early design of the Mouth-stick keyboard, to be mounted on a suitable sturdy articulated arm. 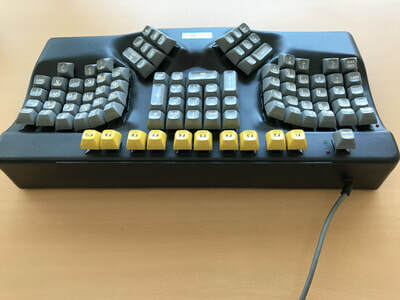 The bespoke letter layout is designed for one digit input, as against ten for dual handed keyboards and five for the single-handed range. 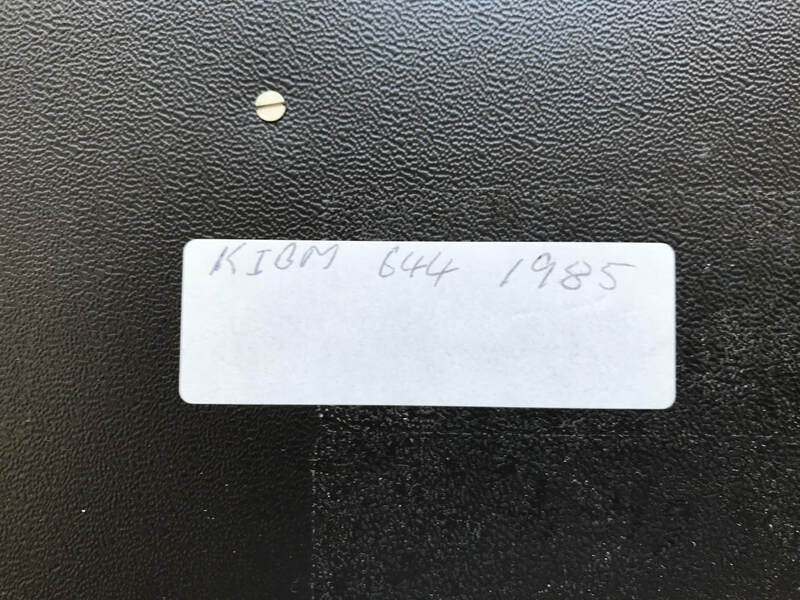 No 788, Type KIBM4, 1990. 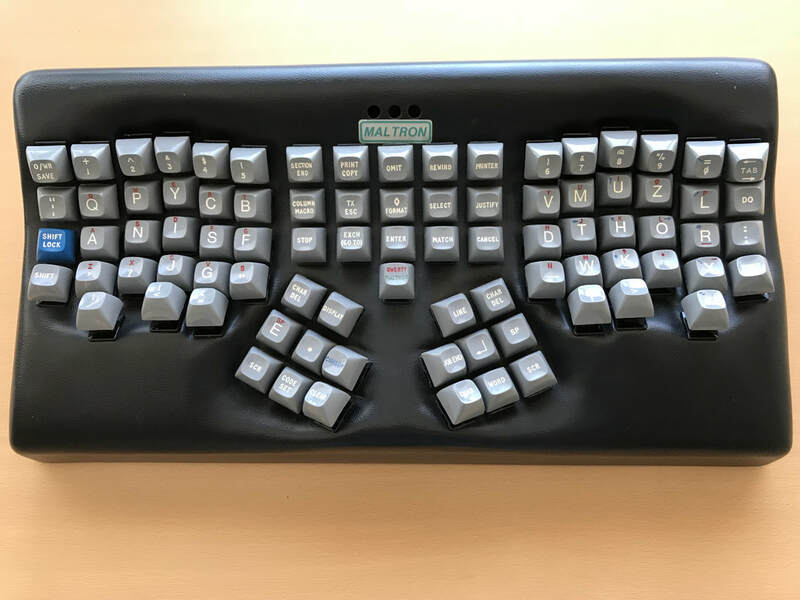 Black with new more angular shape, F1 to F12 and dually engraved keys (QWERTY dominant). 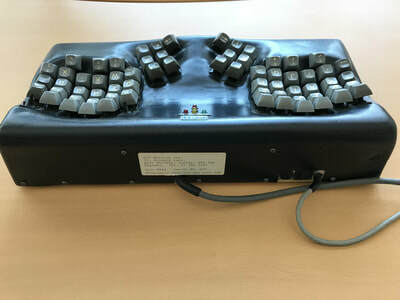 Modified in 1995 to provide dual micro sockets to handle both IBM and Apple. AT connector. 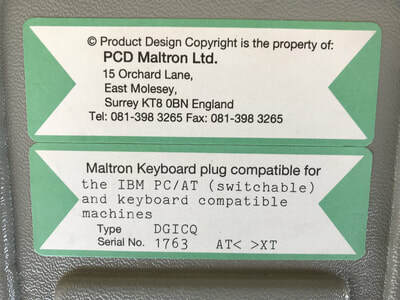 No 1763, Type DGICQ(*), Jan 1994. 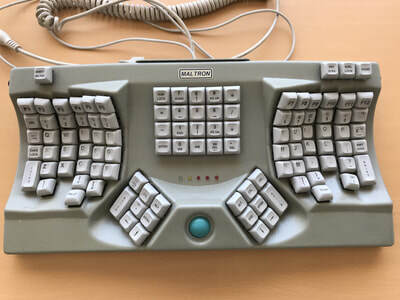 Grey keyboard with new ‘C’ shape allowing F keys to be directly above the number row. 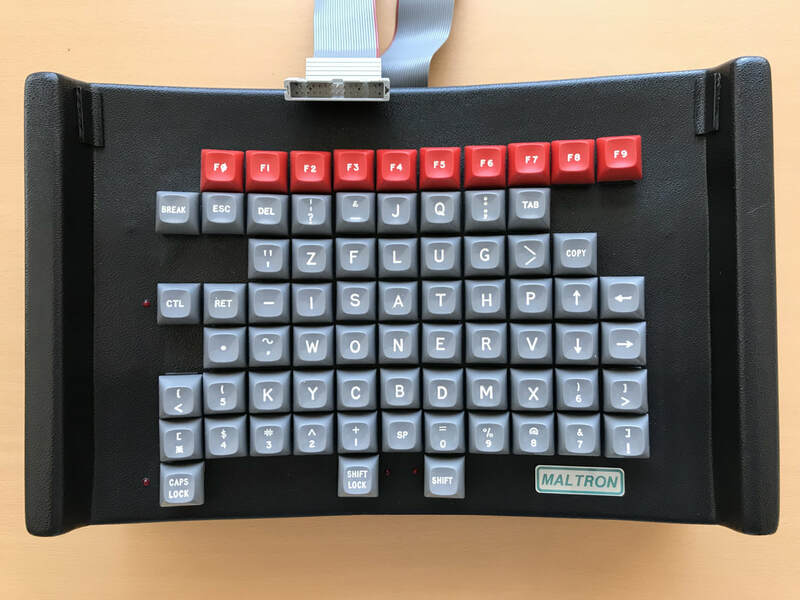 Maltron letter layout. 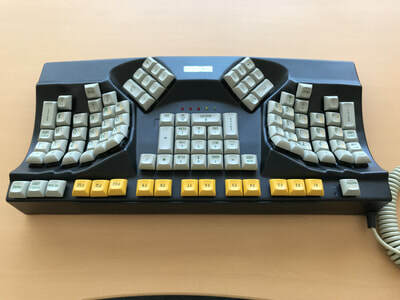 AT connector. 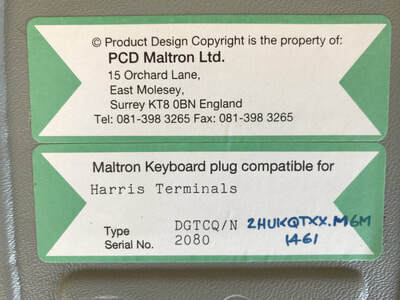 PCB – PCM4B. 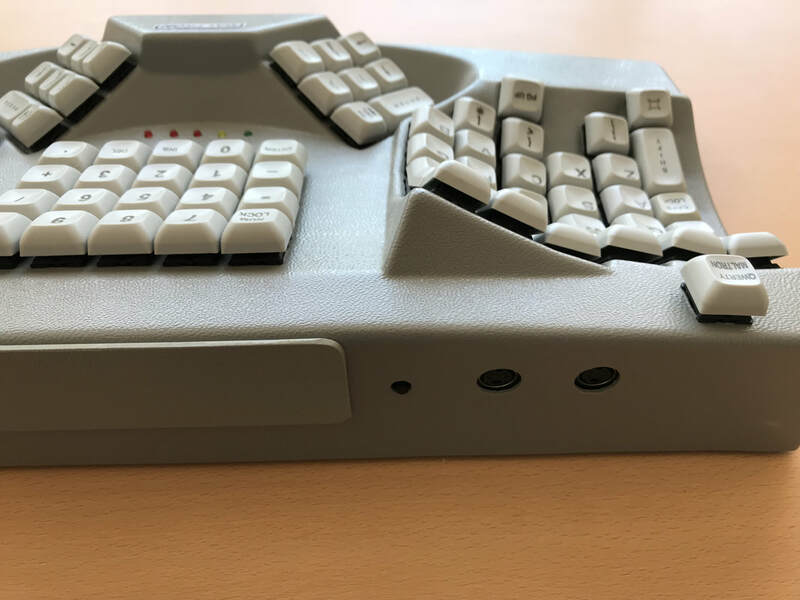 * Dual, Grey, IBM, C case style, Qwerty. 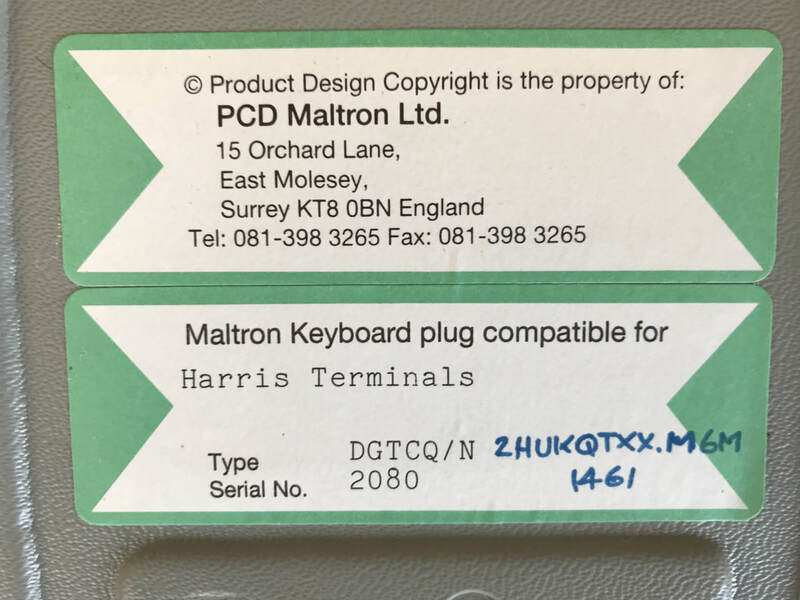 No 2080, Type DGTCQ/N, Sept 1994. 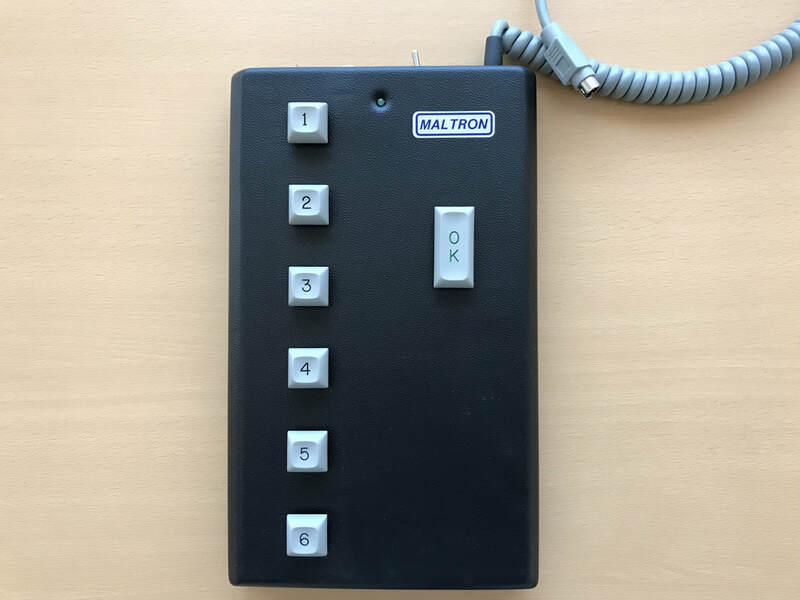 Additional F13 to F24 keys to needs of customer software run on an AS400. Instead of the Maltron letter layout being offered as an alternative a ‘numbers’ layout, (not shown – See 2265), was provided as the user worked in an accounts department. 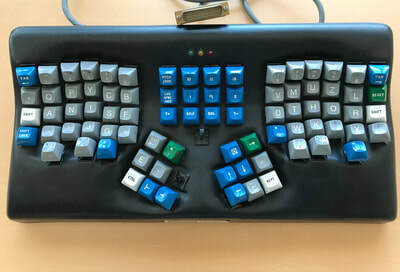 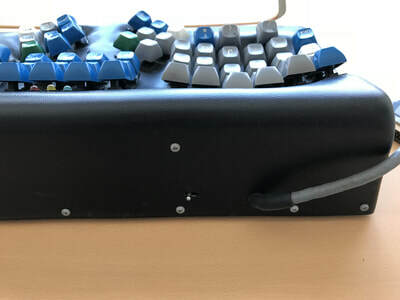 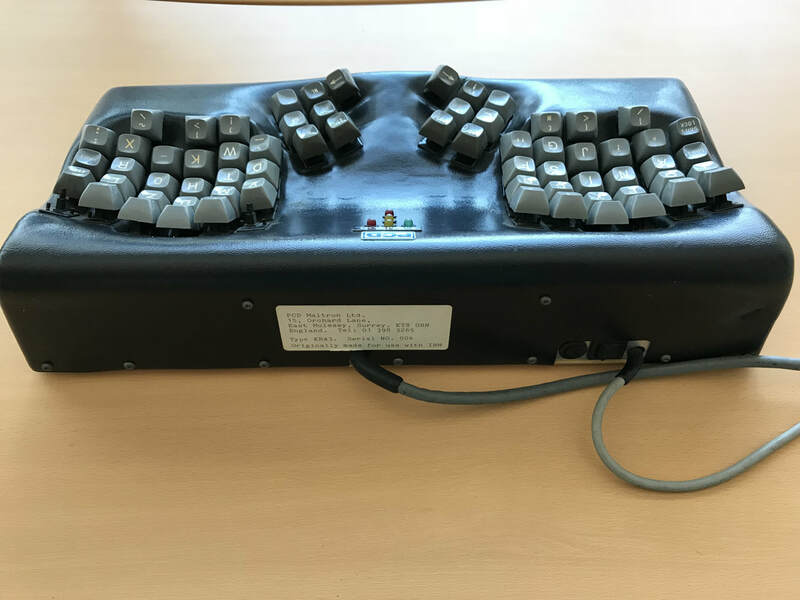 No 2086, A custom input device designed for responses to computerised multiple choice questions. 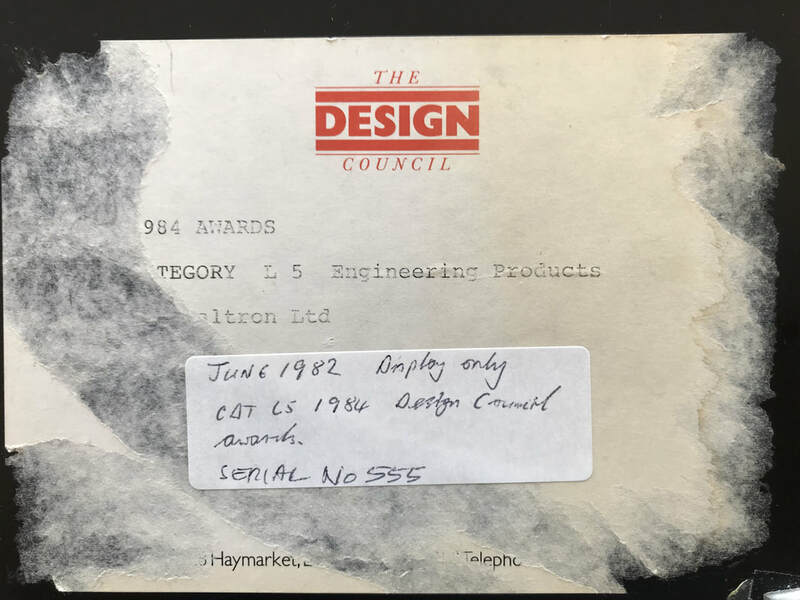 No 2265, DGTFN, July 1995. Similar to 2080 but showing the ‘numbers / Numdata’ layout. 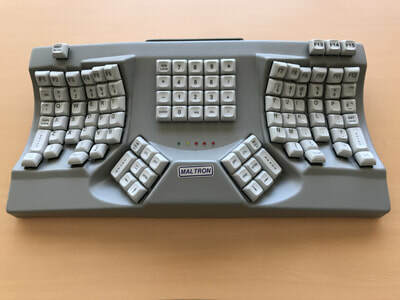 No 2557, Type DGICQ, Oct 1995. 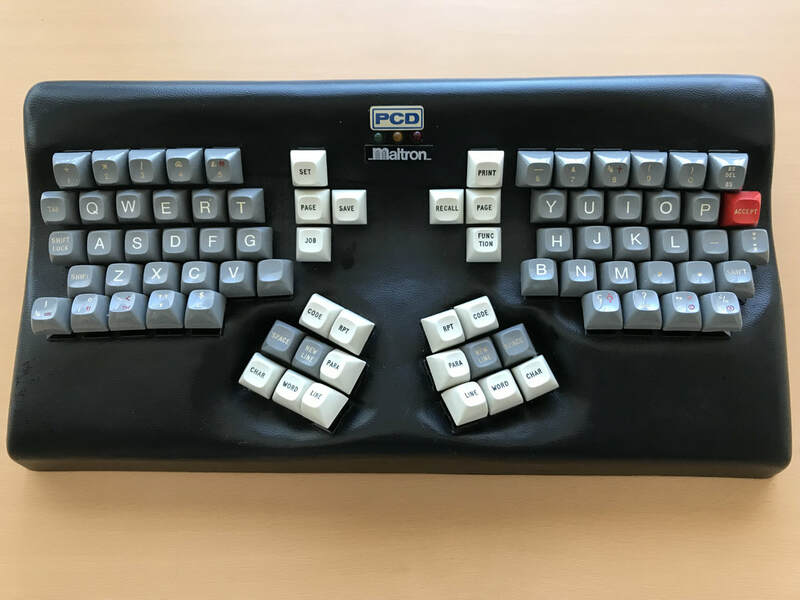 Early example of the standard DGICQ keyboard with printed keycaps instead of engraved. 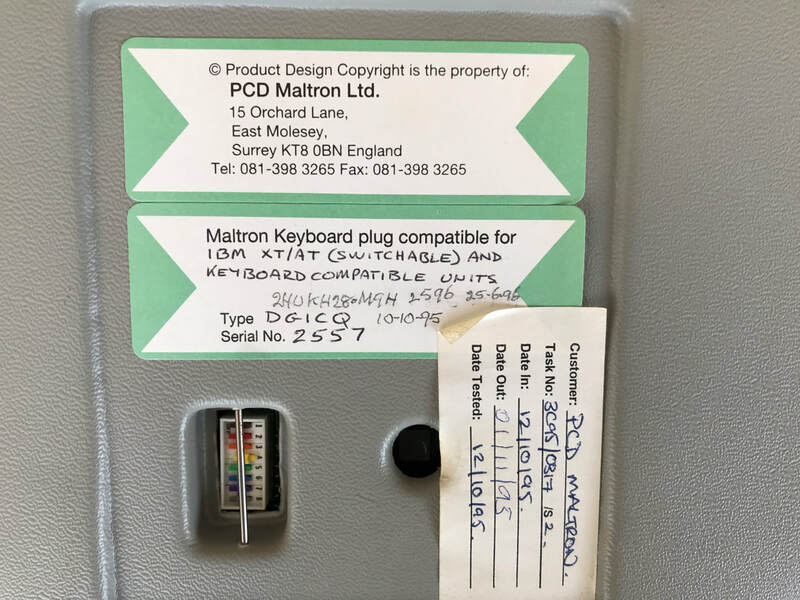 Some 250,000 key caps were printed before lasing took over. 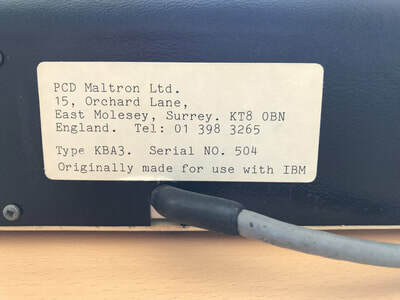 No 3398, DGIDQ, Sept 1997. 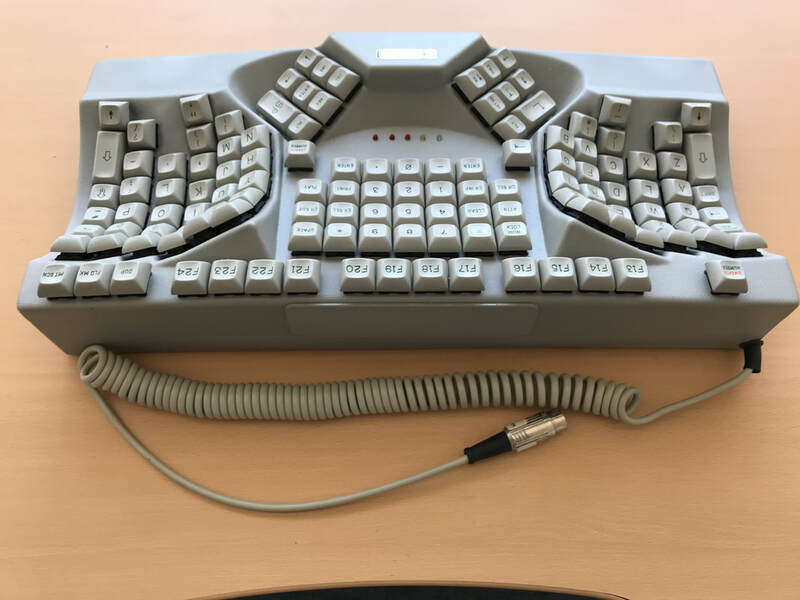 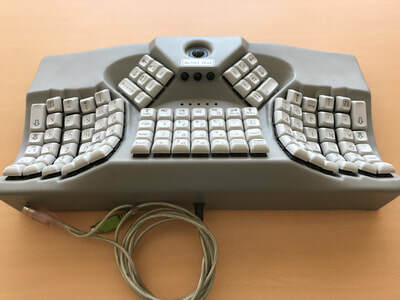 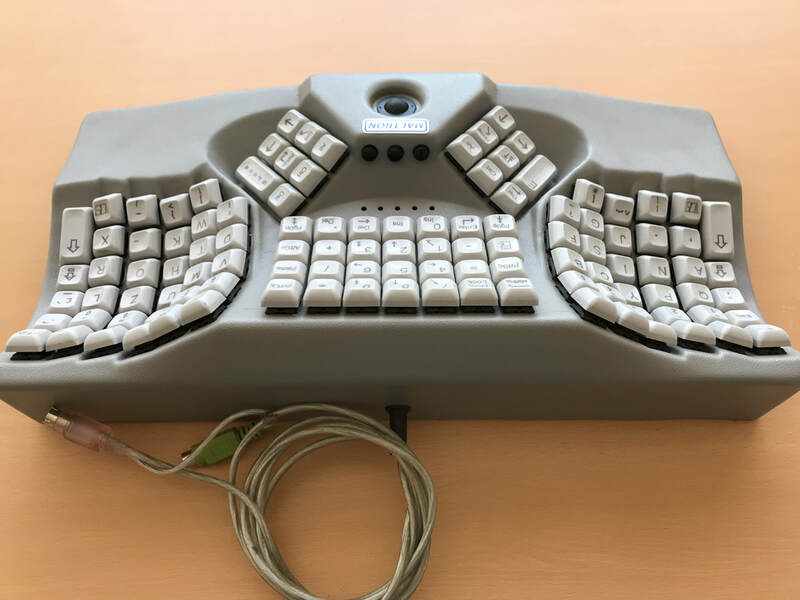 Early example of the Trackball version with AT and serial cables with one set of mouse buttons at both ends of the keyboard. 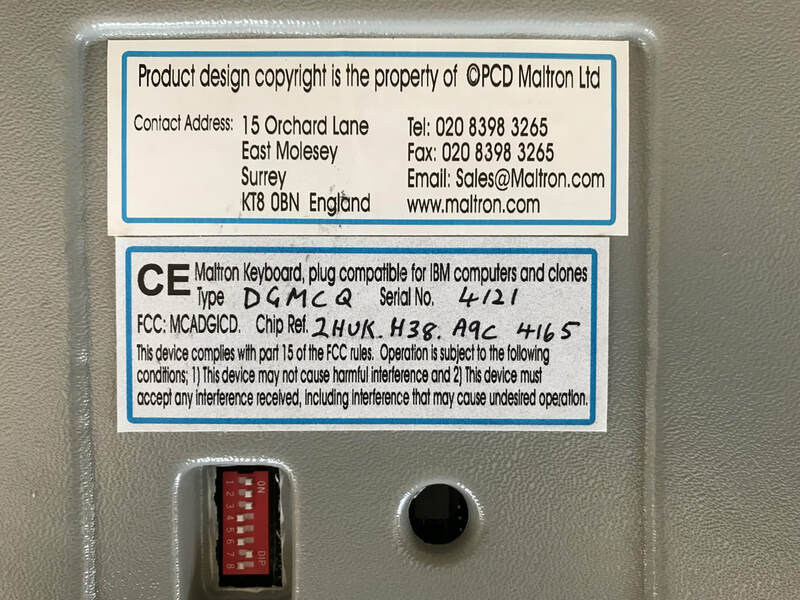 M9 PCB. 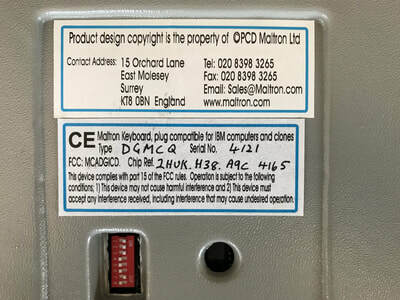 No 4121, Type DGMCQ, March 1999. 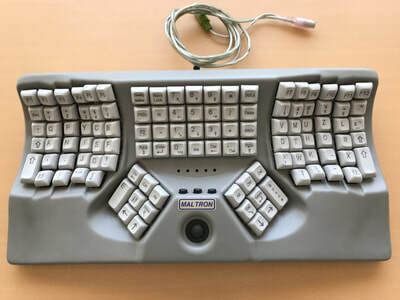 Example of the ‘M’ Mac compatible keyboard with two rear sockets and F1 to F15 keys. 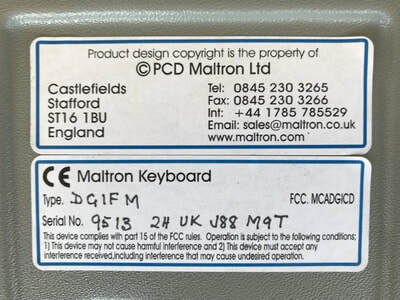 No 9513, Type DGIFM, May 2007. 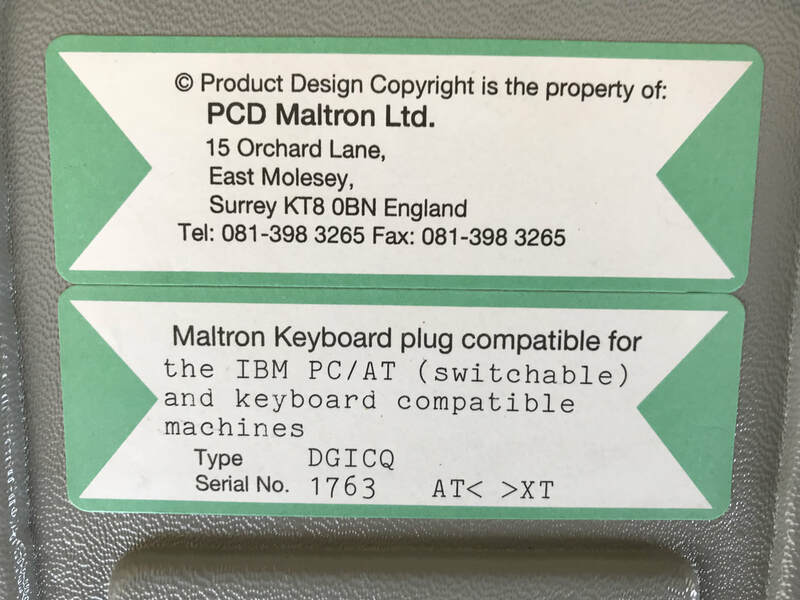 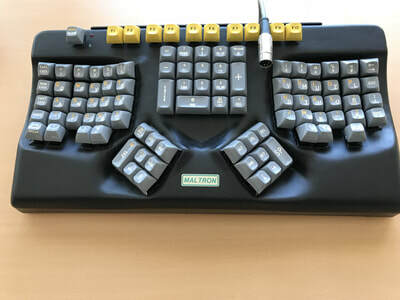 Example of an IBM PS/2 trackball keyboard, Maltron layout with mouse keys close to the trackball.